The nursing shortage is increasing, so the leadership of the 1000 bed hospital where I work had a session last fall to brainstorm a solution. 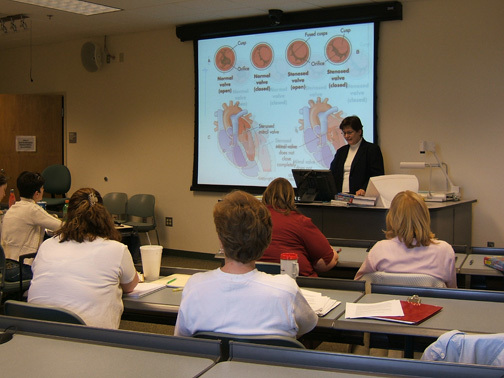 They decided Staff Development should design and teach a refresher course for nurses who have been out of hospital nursing for over five years. The goal is to give the interns review classes in a variety of specialty areas and let them work with a preceptor for 4 months. The hospital will pay them a slightly reduced salary during the refresher course, and then offer them a job at the end of satisfactory course completion. In turn, the nurse must commit to working for the hospital for two years after the refresher course. I was honored when my Director asked me to design and conduct the course. In turn, she relieved me of all my other duties. I barely knew where to start as I could not locate any other hospitals who taught a refresher course. So I held a meeting of all the staff development nurses and gathered their ideas for classes. I made a class schedule and arranged for various nurse specialists to teach in their area of expertise. Next, I took the proposed class schedule and gathered ideas from the nurse managers of the medical-surgical units. We tweaked it again and printed the final schedule. In November, I met with human resources to design an advertisement for the newspaper to run over the next four weeks. They also helped me design interview questions to ask each candidate. As the applications arrived, I reviewed them to choose the top thirty candidates to interview for the nineteen openings. I interviewed all thirty nurses in three days. This was my first time to ask the interview questions rather than give the answers. My heart went out to the ones who were so nervous that they could barely talk. After I completed the interviews, I narrowed them down to the nineteen who I thought would be most likely to become enthusiastic long-term nurses for the hospital. Most of the women had taken time off to raise their children and were now eager to return to the workforce to help put their children through college. We had several younger ones apply who graduated from two-year associate degree programs and felt they needed a longer slower paced orientation to hospital nursing. I have felt overwhelmed this week with the interns starting, but God has carried me through each long ten hour day. It’s exhausting, but I keep looking to God for serving grace. “And He said unto me, My grace is sufficient for thee; for my strength is made perfect in weakness. Most gladly, therefore, will I rather glory in my infirmities (limitations) that the power of Christ may rest upon me” (II Corinthians 12:9 KJV). Three of my problem interns resigned after they decided they were overwhelmed by the changes in hospital nursing. One 50-year-old intern came to work intoxicated from alcohol, so we had to terminate her that day. I was sad to see her alcohol addiction ruin her life. I pray she would receive Christ as her Savior, be forgiven of her sins, and set free from her addiction. “Wine is a mocker, strong drink is raging, and whosoever is deceived thereby is not wise” (Proverbs 20:1 KJV). When I graduated in 1977, there was a surplus of nurses, followed by a shortage the next year. My first hospital imported nurses from South Africa and Canada to solve their shortage problem. The 1987 graduating interns became excellent employees. One of my readers, Deyanara Riddix, sent me an article about the upcoming nursing shortage that is occurring as the baby boomers, such as myself, retire. She gave me permission to post the link for you to read. It is called “Nursing in an Aging America”.